This newly renovated water front cottage with screened wrap-around porch overlooks Atkins Bay and is surrounded by woods at the end of a private lane. The complete kitchen features soapstone counters and a stainless refrigerator. The new bathrooms have spacious showers, soapstone counters, pebble floor, and skylight. There are heated floors throughout the living area. The master bedroom has a queen size bed and private bath. The second bedroom has a queen size bed and shares the second bath with the third bedroom which has bunk beds. The screened porch is perfect for lazy days of relaxation out of the sun or rain. The natural tidal waterfront on Atkins Bay is ideal for swimming, canoeing, kayaking, and sailing. A few minutes drive and you are at the beach. The cottage supplied park pass provides entry to Popham Beach State Park where you can beachcomb, swim, sunbathe, surf, walk, and hunt for shells and sand dollars. After a leisurely breakfast or lunch on the porch stroll the 4 mile beach, swim, collect shells, kayak, explore Fort Popham and Fort Baldwin, fly a kite, or just lie on the beach and soak up the sun. Play golf or tennis at nearby Sebasco Resort, antique in historic Bath, or tour the Maine Maritime Museum. Boats trips and whale watches are available from Boothbay Harbor. The Bowdoin Summer Music Festival and the Maine Music Theatre featuring Broadway musicals are within a 30 minute drive to Brunswick. Don't feel like cooking? Local restaurants provide an ever changing menu of regional flavors. After a fine meal at 5 star restaurant Fore Street in Portland stop in and browse through Cabela's in Scarborough or LLBean in Freeport (never closes...). After a full day fall asleep listening to the sounds of the wind blowing through the trees and wake to the morning chatter of birds. Sarah is a chef and Stuart is a sommelier. After living in France, Spain and New York City, they settled in Maine in 2017. They run the 1774 Inn up the road in Phippsburg, Maine, a bed and breakfast as well as wedding venue and barn event space. They are in the process of adding a farm and restaurant. We love having our morning coffee on the porch watching the sunrise and birds swoop. We also enjoy eating meals, napping and sleeping on the porch, stargazing in the adirondack chairs by the water, kayaking in the bay, cooking out on the grill, and reading and playing board games on the comfy couches in the living room. 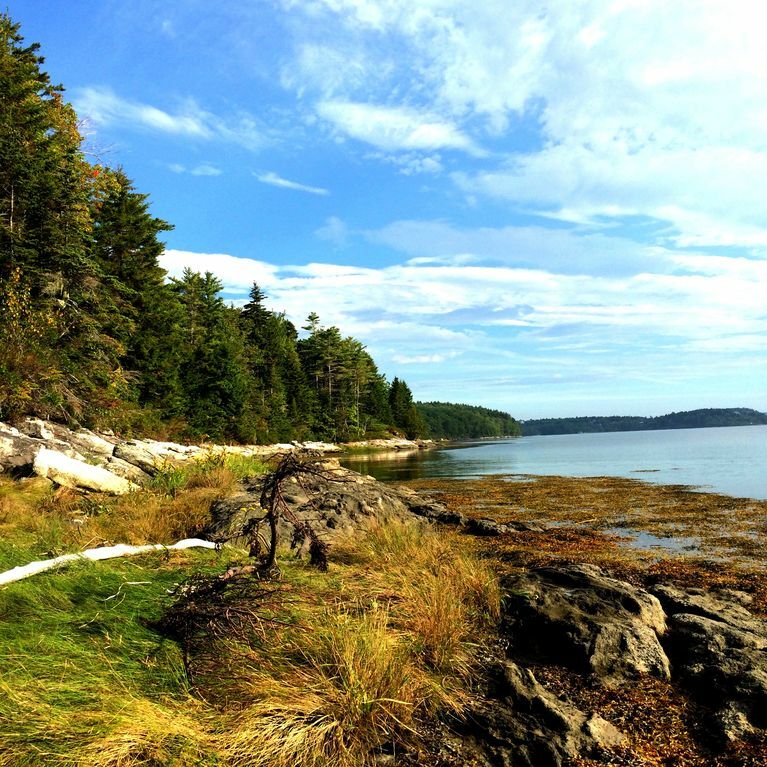 Nearby, we love Popham Beach, Morse Mountain, kayaking, stand-up paddle boarding, light house tours, golfing, fishing, hunting, restaurants, antiquing, boating, hiking, Maine Maritime Museum, Bath, Brunswick, Boothbay, Wiscasset and more. Heated floor for off peak season. The screened porch has a table and chairs for 6, rockers, 3/4 bed, and a hammock. Cottage has 2 kayaks and life jackets available for use in Atkins Bay. This was a wonderful cottage to stay in for the week. It is a great location in the woods on Atkins Bay with a beautiful view. It has a great entry/mud room, which was convenient for coming and going to the beach with our things. It also has a great wrap around screened porch which was a perfect place to relax, eat dinner and for the kids to play. The bathrooms are updated and the kitchen was well stocked. Popham Beach was minutes away, which was very convenient with a 2 and 8 year old as was the pass to Maine’s state parks. It was a charming, private, quiet and peaceful place to stay for the week. Thank you for your kind words, Kristin! We're are so happy that you enjoyed your stay and got the magic that is our home and the surrounding area. We hope you will come back to stay again! This was a wonderful vacation home in the woods with a beautiful view of the bay. The rental is fully updated and very comfortable. There was plenty of room for five of us. it also came with a beach pass to Poppham Beach which we took full advantage of. It is just a few minutes away and a fabulous beach. Overall it was a fabulous stay. Tranquil setting and the cottage is very comfortable with everything you could possibly need. Excellent location very close to the amazing Popham Beach. Cottage is charming with exceptional bathrooms and the best screened porch ever. A wonderful, restful place. We're so glad you enjoyed your stay at this special place. And we're so glad you will be returning next year! You were wonderful guests and are welcome anytime. I would recommend this home to anyone who wants a relaxing vacation. It has a large wrap around screened porch which was an important feature because there were a lot of mosquitoes, even with bug spray. The view from the porch is beautiful! The bedrooms were small, but adequate, and the bathrooms had been recently remodeled. The kitchen was modern as well and was well stocked with spices etc. Beautiful Popham Beach is only a short ride away and there are a couple of restaurants in the area. A lovely spot! The title says it all. Quiet and peaceful. The cottage has been totally remodeled but the old charm remains. It is located in the woods right on Atkins Bay. We could not see our neighbors and we could not hear the cars on Popham Rd. A short drive to Bath for shopping and lots of nice eateries. The cottage comes well stocked. The heated floors in the bathroom is a nice touch. The cottage has a pass to go to any of Maine's State Parks. We went to Popham beach which is only a minute drive from the cottage. The beach has to be one of the prettiest beaches we ever saw. The cottage also has two ocean Kayaks. They were a lot of fun paddling on the bay during the high tides. We went out almost everyday and we were the only ones on the water. The porch, ah the porch. Awesome, screened with skylights. The hammock, the bed and dinning table set. We had most of our meals on the porch. If you are looking for privacy, peace and quiet, I think this is the place. We really had a great relaxing week. 1) No dishwasher. But the kitchen's so nice it's no problem to spend an extra 10 minutes doing dishes. 2) Somewhat remote. If you want to use this as a base station to tour up and down the coast, you could, but keep in mind it takes a good half hour to get back up to Bath and Route 1. We went grocery shopping once for the week and that was it, and took day trips to Brunswick and Boothbay. Fort Popham, just a few miles away, has Spinney's (good family restaurant) and a shop/ice cream parlor. 3) Bedrooms are cottage-sized -- adequate, but not huge. But they are cozy and comfortable, just like the whole cottage. 4) The bay is a tidal bay. Meaning that at low tide, you can see (but not smell!) the flats. At high tide, there's plenty of water to swim in though it's a rocky shoreline. We actually never swam in the bay, choosing to go to Popham (frequently!) with the included park pass. We took this trip with our family of four (2 kids, ages 7 and 5), and my father joined us for a few days. We all loved it and would happily stay again. I want to be clear that no one asked us to put up a review -- I kept telling my wife "We had such a great time, we should put up a review." And as we approach winter in Michigan our kids keep talking about that porch and the hammock and all the fun they had. Other Activities: Kayak from Spirit Pond to the ocean, up the Kennebec River to Atkins Bay and to the cottage. Check-in @4pm. Check-out @ 10am. Please let us know you anticipated check-in time.